These ultra, ultra rare clips — never before released by JazzLegends.com–feature jazz drumming legends that are not often seen on DVD. Highlights include Papa Jo Jones with Ben Webster and Buck Clayton from the late 1950s, a Louie Bellson/Philly Joe Jones/Irv Cottler/Shelly Manne turn on the mid-1960s “Hollywood Palace” tv show, a partial Joe Morello solo with Brubeck from 1964, a partial Max Roach drum solo filmed in Europe in the mid-1960s with Elvin Jones looking on. Seen in their entirety are two, very obscure, “Stars of Jazz” half hour programs from 1958, both hosted by Bobby Troup. The first program stars Shelly Manne and the boys along with jazz singer Mark Murphy. Program two is Paul Horn’s early “new age” renderings, with none other than Mel Lewis on drums. Websites like YouTube, MySpace, DailyMotion and the rest–to say nothing of the plethora of drum sites out there–are invaluable guides to learning and wonderful clearing houses for knowledge and information. By way of making available hours of vintage footage from the legendary jazz drummers, percussionists of every age have the ability to enjoy and learn from the likes of Gene, Papa Jo, Big Sid, Buddy, Tony, Art, Max and the rest. Influences of these giants can already be heard in the playing of the younger artists out there and I know they’re really listening to these legends more than ever. Mainstream publications like Jazz Times and various drum magazines are directing readers to what they believe are “the best” clips on these sites. Until the advent of such sources of video and audio, where did drummers and music fans have to go for their info? Most likely to videos and DVDs with titles like “Gene Krupa: Jazz Legend,” “Gene Krupa: Swing Swing Swing,” “Legends of Jazz Drumming,” “Classic Drum Solos and Drum Battles,” “Buddy Rich: Jazz Legend,” “Lionel Hampton: King of the Vibes,” and more. What do those titles, still very much in print, by the way, have in common? 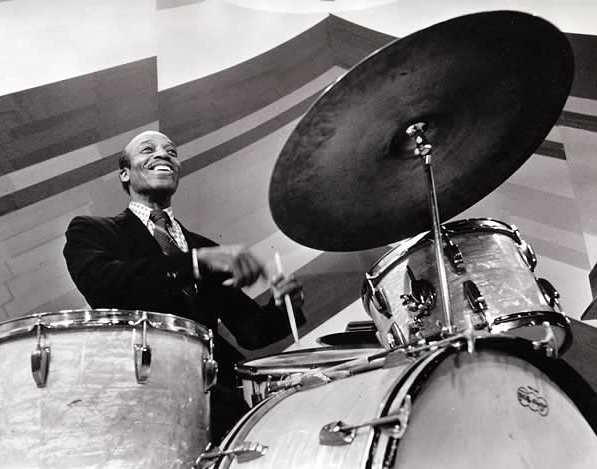 They were produced by true visionaries, from companies like DCI Music Video, Warner Bros. Publications and Hudson Music, who pioneered the concept of the “performance-oriented retrospective” on the great drummers in history, and enlisted such names as Steve Allen, Mel Torme’, Louis Bellson, Jack DeJohnette, Roy Haynes and Mike Mainieri to narrate and add commentary to these projects in an effort to reach as wide an audience as possible. Oh, yes. They also were all co-produced and written by me, and I can give you no accurate estimate of the time and expense it took to put these together. These films were made to viewed in their entirety, with the narration, the order of clips, and the hundreds of historic photographs spanning 75 years of music adding up to a complete and organic “whole,” i.e., the sum of its parts. Around a good 80 percent of the clips from these DVDs and from others are all up on YouTube and the like, free of charge, and with no credit given as to where they came from . It is not only the fault of the site (“You want to sue?” we were once asked by someone from YouTube, “Then stand in line behind CNN, Paramount, CBS, NBC and Disney”) but the fault of those who have purchased the products through the years and upload them on such sites without regard for those involved in the creative end, and without regard for those who spent hundreds of hours and thousands of dollars finding these historic gems. When this started happening, and it blossomed rather quickly, my hope was that these clips on YouTube would feed into interest and hopefully, sales, for the complete product. In other words, if someone posted the famed clip of Gene Krupa on The Dean Martin Show and put a credit line on the clip that read–“from the Hudson Music video ‘Gene Krupa: Swing Swing Swing’–then maybe a few YouTubers would check out the actual video, buy it, and make it financially possible to produce more. That hasn’t happened, except in a rare instance or two, and too many of the folks posting this material are either in states of denial or are just plain lying. For instance, one chap I emailed about unauthorized posting of material with no credit given claimed he found the video in a thrift shop in an unmarked package and therefore had no idea as to its source material. I guess he didn’t watch the part of the tape that said “a Hudson Music release produced and written by Bruce Klauber.” Another fellow challenged me on ownership. These people are basically coming on my job and doing it for free. I wonder what would happen if I showed up at their places of business and did their work for free. If this sounds like sour grapes, that’s because it is. Like I’ve said and have said many times in this space and other places, if we can just give credit where credit is due, then everyone profits. Folks get to see the free clips, with credit lines, on YouTube. In that way, everyone has the chance at profiting. YouTube cannot be stopped. It’s just too large. And because of what they and the YouTube visitors have created, the “given” is that all this material should, quite simply, just be free for everyone. One of the things we’ve tried to do through the years at JazzLegends.com is to discover and offer film and audio that is just not available on YouTube, DailyMotion or anywhere else. Perhaps you’ll see a clip or two from one of our discoveries, but never the whole DVD or CD. Likewise with the long-anticipated Internet drum channels from Hudson Music and Drum Workshop. Though still in the development stage, they will be offering everything from drum lessons to vintage films and interviews with the giants in a manner where everyone involved is duly compensated and credited. I must also add here that the vast majority of drum sites, from Drummerworld.com on up and down, to a fine, fine job of crediting everyone involved in what they post, including artists, photographers, producers, writers, etc. Is there still a market for the stand alone DVD? You bet there is, given that it’s material you can’t find on the Internet. And that’s what JazzLegends.com will continue to devote itself to. There’s a wonderful article in the March 20, 2005 edition of the Sunday “Philadelphia Inquirer,” written in the first person, about a man who went into a major electronics store in search of a boom box that played CDs and tapes. Surprise! Those units are not made anymore. While you can certainly get tape players, they are no longer being included as a part of portable units. Reason? The kids don’t want, buy or need tape anymore. This development, which is really nothing new, might someday apply to VHS video tape. Certainly, VHS will always be “around” — just like LP records — so those who have VHS tapes will always need something to play them on. However, in terms of motion pictures and all other commercial product that you see in your local Blockbuster, VHS has been phased out and is pretty much gone. DVDs? They take a while getting used to, especially for those who were born long before the digital revolution. In the case of JazzLegends.com, though, there are distinct advantages. VHS is a mechanical medium, and because it is, things can and do go wrong. Copying a VHS tape always means losing a generation of quality. 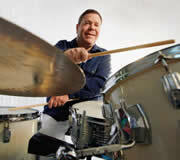 Consider the terrible quality of some of those Buddy Rich tapes that have been floating around for so many years. That probably wouldn’t have happened if the dupes were made from a top quality DVD. And of course, they take up less space, you can get to the programs’ “good parts” instantly, and they don’t deteriorate in quality. Just don’t scratch them. Warner Bros./DCI Music video is now in the process of putting most of their catalog on DVD. “Buddy Rich: Jazz Legend” and “Gene Krupa Jazz Legend” are already on DVD, “Legends of Jazz Drumming” will be shortly, and in the DVD process are the famed, “Buddy Rich Memorial Scholarship” concerts. All Hudson Music product has long been on DVD. We don’t know the age of our supporters at JazzLegends.com nor are we aware of how these friends of ours feel about the new technology or DVD versus VHS. What we do know is that the time has come where we have to offer our line of videos on DVD. These will be in the DVD-R format, which we understand is the most playable format in this country. They will not, we are told, play on foreign systems. So for our international customers and for those who want to continue with the good, old VHS system, will will continue to carry all our titles on VHS as well. And we always will. Let us know how you feel about this, and start ordering!